Premium Sound System Pontiac GT with GALAXY SILVER METALLIC exterior and DARK PEWTER INTERIOR interior features a V6 Cylinder Engine with 175 HP at 4800 RPM*. GT (CF5) Sunroof, power & (U1Q) Sound system, ETR AM/ FM stereo w/cassette & CD player, (PY2) Wheels, 16" (40.6 cm) aluminum, torqued Chrome Tech, SOUND SYSTEM FEATURE, XM SATELLITE RADIO *100 channels of digital quality sound that goes wherever you go - coast to coast. GM maintains exclusivity for factory installed satellite radio for 2003 model year*, SOUND SYSTEM, ETR AM/FM STEREO W/CASSETTE & CD PLAYER Radio Data System, seek-&-scan, digital clock, speed-compensated volume, TheftLock & programmable equalizer, FRONT BUCKET reading and courtesy lights, uplevel seat design, w/driver & passenger side seatback pockets, (NP5) Steering wheel, leather-wrapped rim shift knob & parking brake handle (STD), ENGINE, 3.4L 3400 V6 SFI (175 HP [130.5 KW] @ 4800 RPM, 205 LB.-FT. [277.4 N-M] @ 4000 RPM) (STD), ELECTRONICALLY CONTROLLED W/OVERDRIVE (STD). Remote Trunk Release, Keyless Entry, Traction Control, 4-Wheel ABS, 4-Wheel Disc Brakes. 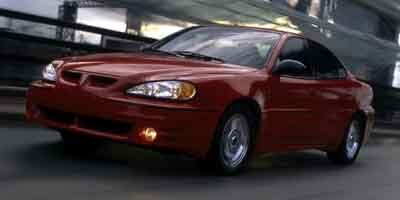 newCarTestDrive.com's review says "Pontiac calls the Grand Am "sports car excitement with room for everyday life." Obviously, this combination appeals to a lot of people because the Grand Am is one of the 10 best-selling vehicles in the U.S.". 4 Star Driver Front Crash Rating. 4 Star Passenger Front Crash Rating.